We can offer a complete platform including support and operations using the Nordnet nExt API for fully automated trading in Swedish stocks. The platform is certified by Nordnet for the production environment since july 2016. The certification though is personal (for me), so in order to trade with it authorization as a proxy is needed (ie. fullmakt). Full tick and trade feed for the instruments subscribed (100+ at the moment, but probably capped to 100 in the future by Nordnet). InMemory database design for performance and speed using both flat lists and hash structures when needed. Creation of 5 minute bars for analyzing and for signal generation. 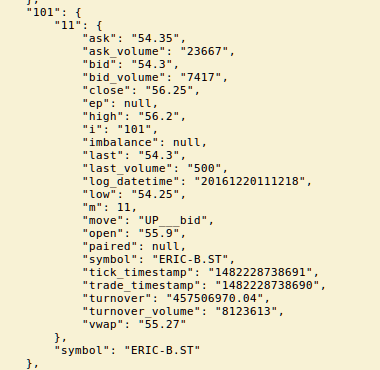 Daily JSON objects updated with 5s intervals. Continuos order polling and order handling using files in JSON format. Response times in the 1/10s to 1s timeframe depending on connection and server. 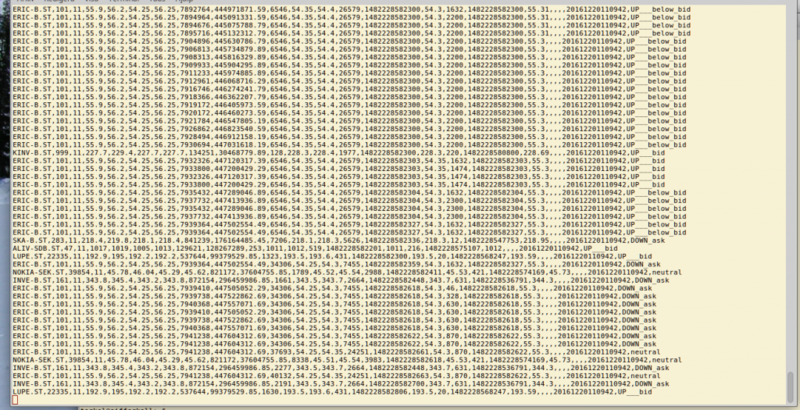 “Unlimited” number of simultanous order using threaded design. 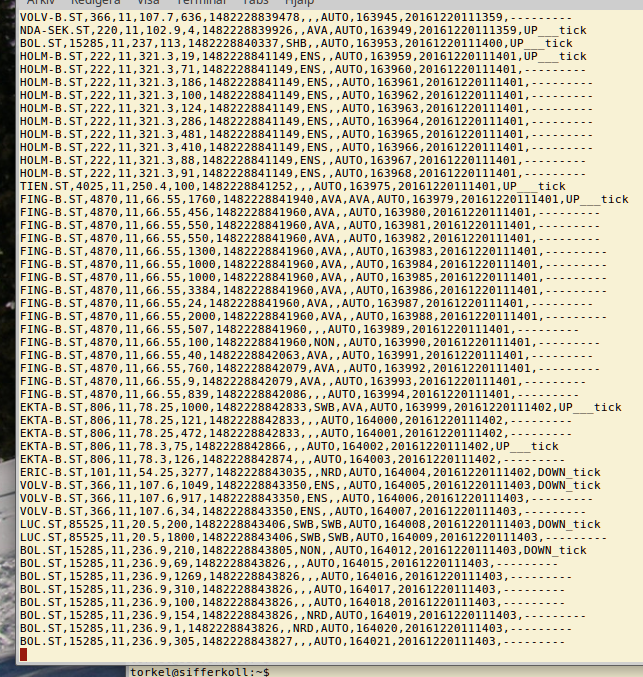 Several proprietary execution algorithms (functions of current bid/ask spreads, order sizes, time constraints, etc.). Runs on any Linux server, built using Perl for maximum flexibility. A standard VPS works fine. Built in keep-alive and process monitoring. Full tick feed since August 1, 2016 for backtesting. Some screen dumps showing price data and tick/trade feeds. Please send me an email if you are interested in getting more information. The info@ adress at the domain of this site works fine!